Your doctor has diagnosed you with a visually significant cataract and you have signed consent forms putting you on the waitlist for surgery. This information will help you with future decisions, answer some questions you may have and remove some of the mystery of what is to come. 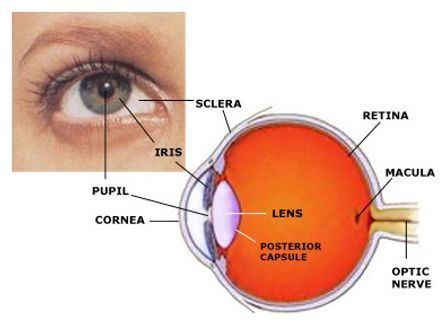 The lens of your eye functions very much like the lens in a camera and focuses incoming light rays onto the retina. The lens is contained in a very thin, membranous bag called the capsule. The capsule is held in place by tiny filaments called the zonules. The retina, at the back of the eye, acts much like film in a camera by gathering the visual information and sending it to the brain. If the information presented to the retina is blurry, it will send a blurry image to the brain and you will see things blurry. The lens must be clear and have the correct power to focus images at distance. The natural lens is flexible in the early years and can adjust focus to near objects (this is called, Accommodation). This ability to accommodate is slowly lost with age as the lens stiffens, beginning in the early 40’s. This loss of accommodation, called Presbyopia, is why reading glasses become necessary. A refractive error means that the eye does not focus light sharply on the retina and the image that is seen is blurred. Refractive errors include Myopia (nearsightedness: too much focusing power, so there is more blurring of objects at distance), Hyperopia (Farsightedness: not enough focusing power, so nearer objects are more blurry), and Astigmatism (blurring of near and distant objects due to irregular curvature in the cornea, lens or both). The lens is made mostly of water and protein. The protein is arranged to let light pass through and focus on the retina. Sometimes some of the protein clumps together and starts to cloud a small area of the lens. 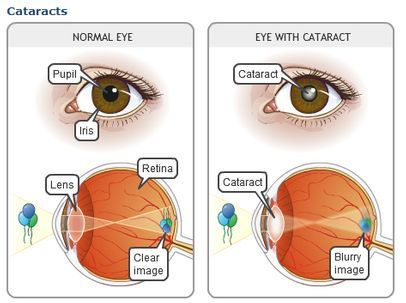 This is a cataract. The lens is located behind the iris and is normally clear. Light passes through the pupil, the dark area in the centre of the iris, to the lens and because cataracts block this light they can cause vision problems. New glasses may temporarily help your vision but over time the cataract may grow larger and cloud more of the lens, making it harder to see. There is no current medical therapy such as eye drops or diets available to prevent or treat cataracts. Fortunately cataract surgery has a high success rate. The purpose of cataract surgery is to remove the clouded lens of the eye (the cataract) to improve sight. Based on your symptoms you and your doctor will decide together when surgery is appropriate. The surgery is done as an outpatient procedure at the Sechelt Hospital and is done under topical anaesthetic (freezing drops). 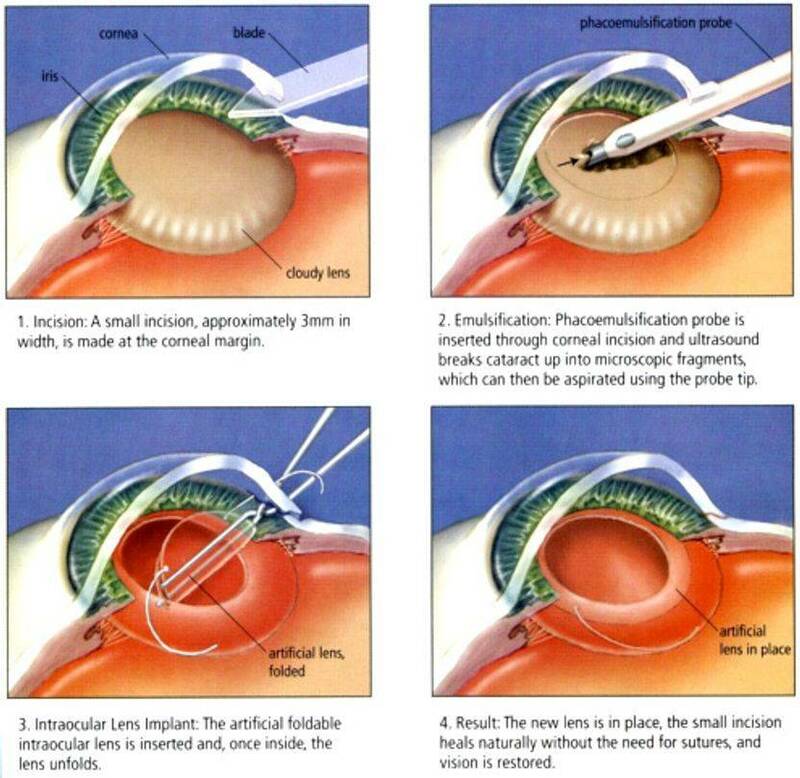 Using a microscope for magnification, a small incision is made in the eye and an ultrasound probe is used to break up the cataract into tiny fragments (phacoemulsification) and these fragments are then vacuumed out of the eye leaving behind the capsule. The lens will be replaced with an artificial lens called an intraocular lens implant (IOL). You will be required to take medicated eye drops before and after surgery. Most patients will require reading glasses after surgery, but these glasses are not usually that strong. Your eyes must be measured so that your doctor can choose the appropriate focusing power of your IOL regardless of whether you choose a basic lens or a toric lens. The power of your IOL must be accurate to achieve the optimal visual result. This power varies with each individual and is different for each eye. There are two ways to measure your eyes. The first is the basic measurement, fully covered by MSP. It involves measuring the length of your eye and average curvature of the cornea. This information is put into an older formula to estimate the required lens to give you good vision. The second is an advanced measurement that provides a full topography of the cornea, measuring abnormalities of the eye, including astigmatism. It provides your surgeon with further information that allows him to use more modern formulas and fine tune the lens selection. It is a required measurement if you are interested in a toric lens but is optional if you are having a basic lens. This measurement is a cost of $185 per eye. If a toric lens is used there is an additional $100 fee due after surgery for comprehensive refractive analysis. To take the place of the clouded lens a precisely engineered artificial lens, an IOL, is implanted into the eye at the time of the surgery. It is permanently fixated in the eye, in this way, it cannot fall out, does not require cleaning and does not change the appearance of the eye. It produces no sensation and cannot be felt. The IOL is permanent because it is made of a perfectly transparent material that will never cloud. Once in place it will not move and because it is lightweight and flexible it will not be affected by physical activity or by rubbing the eye (after the first few weeks after surgery!) and you can resume all physical activity without restrictions once healed fully. The standard Single focus foldable IOL is the most commonly used type that is fully covered by MSP. It is designed to correct vision at ONE distance. Simple myopia and hyperopia can be corrected with this standard lens. Your doctor recommends correction for distance vision (80% of the time you should be able to see distance without glasses) with the use of reading glasses most likely still required to achieve full range of vision. Your doctor recommends correcting for distance vision. This is basically trying to get you to 20/20 vision. You should be able to see things clearly from arms length and further away without glasses (80%). For arms length and closer you would need reading glasses. There is also monovision. People with presbyopia ( farsightedness caused by loss of elasticity of the lens of the eye, occurring typically in middle and old age) must still rely on reading glasses for clear near vision. Monovision can be used to help reduce the need for bifocals or reading glasses. One eye is fit to fully correct your distance vision, while the other eye is fit to correct your near vision. While it may sound strange, monovision actually works well. The downside of monovision is that some people find it compromises the clarity of their distance vision too much, making distant objects appear slightly blurred. Others find monovision doesn't provide adequate near vision to give them the freedom from reading glasses they were hoping for. Also, although the two eyes still work together as a team in monovision, binocular vision is slightly compromised, which can cause a slight decrease in depth perception. It is usually best if you experience this prior to having surgery to make sure you will able to adapt to this type of vision correction. While some people adapt quickly to the effects of monovision, others find that both eyes may not work together as well as they did before. Mini-monovision is a term for a mild amount of near correction. Your vision is not expected to be perfect with mini-monovision but it does afford you a little wiggle room to get along while shopping and other activities so you will not have to wear reading glasses all the time. You may only need reading glasses when you sit down to perform intense reading or other close-up work. In this variation, a less-than-typical magnifying power is added to the near vision lens. Mini-monovision often is an excellent solution for people who find that standard monovision does not give them the sharp distance vision they desire, and they don't need to do a lot of close-up work (or they don't mind wearing reading glasses on occasion). A good example is someone who spends much of their day driving and little time working on a computer or reading, but wants to be able to read a menu without prescription glasses. Though a person with mini-monovision may need to use reading glasses more frequently than someone who has standard monovision, he or she will be less dependent on readers than a person wearing regular (distance) contact lenses in both eyes. Once your doctor has indicated you have cataracts and you have signed the cataract surgery consent forms the process begins. Donna receives the consent forms and then adds your first eye to the Sechelt hospital waitlist for cataract surgery. Your surgeon will continue to follow your health with regular 3 month or 6 month visits to monitor the cataract progression. Our waitlist can be lengthy, up to one year. Donna will call you to arrange to come in for measurements approximately 6 months or less before you are due for surgery. IF YOU WEAR CONTACT LENSES you must remove them prior to this measurement. For soft contact lenses at least 2 full days before and hard contact lenses at least 2 weeks prior to measurement. The contact lenses can change the shape of your eye and affect the accuracy of your measurements and in turn the vision you will have after surgery if they are not removed beforehand. You will be asked if you want to do basic or advanced measurements and to bring payment as either cash, cheque or debit card. Also please let Donna know if you have had any previous LASIK or Laser surgery to correct eye vision. This will change the type of calculations that will be needed to be done to compensate for the changes made to the natural shape of your eye. It is to your benefit it you can provide any information about your eyes PRIOR to the lasik surgery to help more accurately choose a lens to give you the best vision after surgery. At your appointment Donna will review what to expect for the surgery and the drops that you will be required to take. She will discuss the lens type you would like if you are a toric lens candidate, as well as the type of vision you would like after surgery (Distant, Mini-monovision, Monovision). This is also the time to let her know if you will be away for holidays in the next months. She will give you a better approximation of when to expect surgery but please know this is only an approximation and could be sooner or later as the waitlist is flexible and fluid. If you are experiencing more symptoms with your vision PLEASE check in with your doctor. Donna is able to move you ahead in the waitlist only if your doctor agrees to expedite your surgery.